For the past 3 months every training and even the 55 km Lommeltrail had one goal behind it, getting better and stronger for this trailrun. These posts will give some insights in how I prepared up to the last week before the race. This blog post continues from there, the last few days before the start and the actual race report. The last week before the start of course contained a decent amount of rest to let my body recover from the training runs to have enough energy for the race. Normally this is always a difficult period for me since after one day of rest I usually just want to go out for a run or ride. This week was actually the first time that I was relaxed in the tapering week. I had a last night training on Sunday night and some light exercises and a short run during the week, but I mostly rested and for the first time it felt relaxed. During this last week I took the time to pack my drop bag and race vest to make sure I did not have to worry about this on the day before the race. As for the race goal? The goal that I had set for myself was to finish, to finish in good health and preferably cover the entire distance running. As for a time goal? When I initially signed up for this I thought it would be cool to finish before sunrise, which would mean I roughly have 8,5 hours from the start. 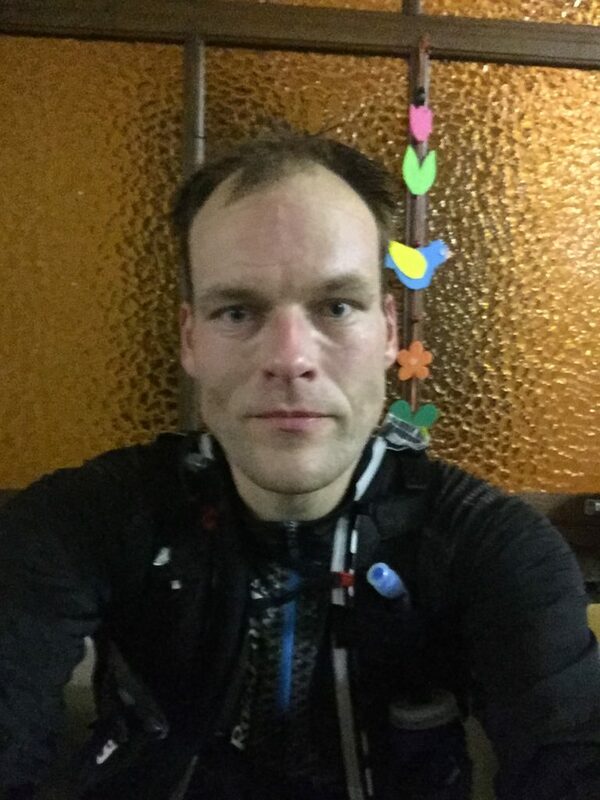 This pressure was further increased by quite some people thinking and expressing that I could do that, run even faster or go for the 100 mile race. I started thinking all kinds of what if scenario’s on how fast I would be able to get to the check points and how I would make sure that I would not waste too much time during breaks, what pace I would try to run, etc. At some point it turned thinking about this race into stress, which is not why I am into this sport at all. And so I dropped all the goals instead of the very simple goal, to just finish it and enjoy the ride and experience. Helped in this by a call of my friend Tom Maessen a few days before the race who wished me luck and strengthened my belief that it is a great adventure to be on and that speed is insignificant. After a short 4 kilometer shakedown run, to see if I can still run, and a healthy breakfast I pick up the rental car I have rented through SnappCar. Since I no longer have the luxury of a company car for the time being this is a reasonable solution to have a car at my disposal for a decent price. The choice for this weekend…. 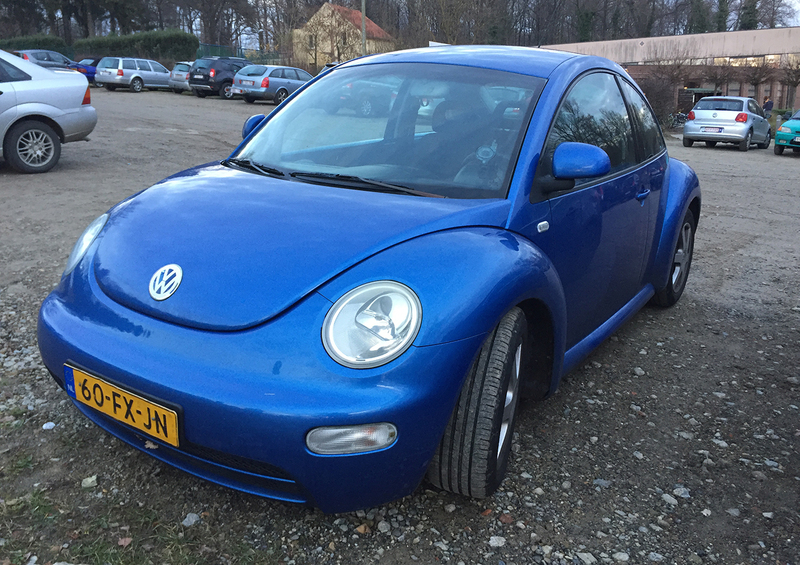 A 17 year old VW Beetle. It brought us to Oud-Heverlee (Belgium) where we have booked a nice hotel just 2,5 kilometers from the start / finish location. After checking in to our hotel we head to the start location to join the rest of the Legends Trails crew. It is great to meet all these people again and it sort of feels like coming home. We fill the rest of the afternoon by helping out in the preparations for the event, hauling tables and chairs and helping out with food preparations for the check points of the race and the pre and post race meals for the runners. In the evening more and more 100 mile runners come in for the race registration, their race starts Saturday morning at 4 AM. Together with these runners we enjoy a nice pasta meal after which we head back to our hotel and go to sleep as early as 9 PM, I want to be well rested for the race the next day. After a good night of sleep in our hotel room we wake up at 7 AM and have breakfast together in our hotel room. We go to the village nearby to do some grocery shopping before we head to the start location, where we arrive at 10:30. As Astrid is helping out with the rest of the volunteers to prepare food for the runners I am quietly in a corner working on this blog post and keeping an eye on the live tracking of the runners of the 160 kilometer race. At 11:47 the first 160 kilometer runners arrive at the start location which is their halfway point in the race, considering they have started at 4:00 AM that’s quite an impressive pace for such a long distance race. As Astrid joins the rest of the volunteers again I just relax as I watch the 160 kilometer runners come and go. At 14:00 the race registration opens for the 50 mile distance and I pick up my race bib and drop of my drop bag. 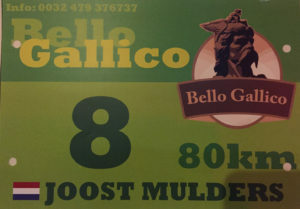 It still feels a bit weird to see my name on a bib with the 80 kilometer distance on it, but it’s there and I am actually going to do this. After Astrid leaves for her volunteer duty as a traffic director I go back to our hotel to have a bit of resting time before the race starts. At 23:30 we get a race briefing explaining us that we should follow the yellow signs, take care of each other and call the race organization if we encounter hunters on our run. At 23:50 we head outside for the start. While all of us gather in front of Tim and Stef I have a short chat with Paula Ijzerman and Mark Groenenweg who are next to me in the starting area. Around me people start turning around and shake my hand, they recognize me from my blog posts and wish me luck. 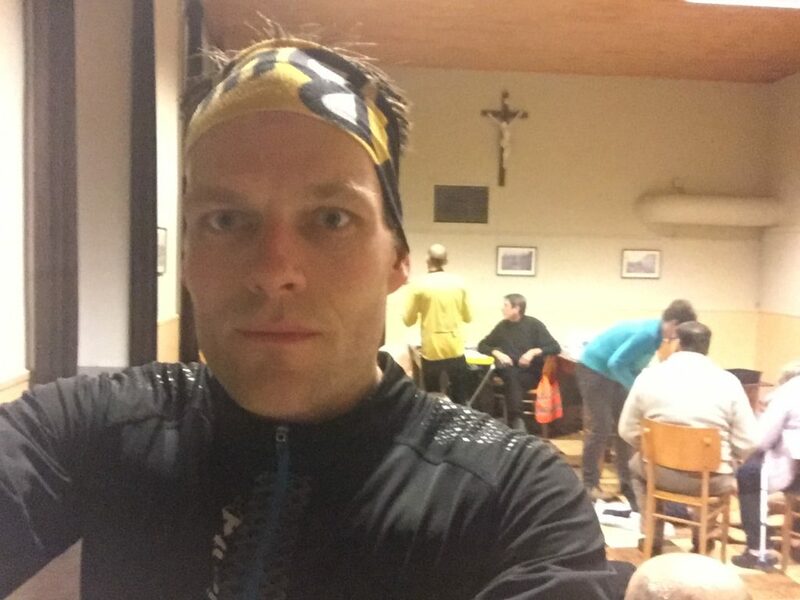 As we wait for the starting signal we joke a bit about how foolish we are to be here in the middle of December in the middle of the night to run 80 kilometers through the dark. Tim and Stef count down to midnight and off we go, into the night, 81 kilometers of trailrunning through the night lie ahead of us as we run up the hill…. After the start we directly end up in the forest where we greet and applaud for a few 100 mie runners that are just on their way to the finish line. Just as in every race there is a bit of chit chat between runners. I am usually very quiet at the beginning as I am nervous and just try to find my place and today was not going to be different. So I just listen to the story of how Mark Groeneweg got into this event as I follow along and try to find my pace. We run along some singletrack in the first few kilometers and as we progress through the forrest small groups of runners start to form. I have done a few short night runs about a bit over a year ago so running with just a headlamp is not completely new to me, but since it would be dark until about 8:15 – 8:30 this run would mean over 8 hours of running in a dark environment. Just two days before the days I remembered an idea of Astrid to improve the lighting conditions. the adjustable strap of a headlamp meant that you can also put it around your waist. And so I bought an additional headlamp, a Petzl Myo and had a secondary light source for this night run next to my Petzl Nao headlamp. Even though this extra light made it easier I still needed to get used to this image that I would be seeing the next 8 hours. 8 hours until daylight starts to set in. I am not hungry so I need to remind myself to refuel along the way and so I take two energy gels during this first stretch, one at 10 km and the second one a few kilometers before the first check point. The pace of Mark Groeneweg and me seemed to be a good match in this run and so we ended up together early on in the race. Somewhere halfway on our way to the first check point we approached a runner a bit ahead of us, when we have joined him I recognize him as Dennis Stoutjesdijk and the three of us continue together. Just before the first checkpoint I fall behind them a bit due to a short toilet break in the woods, alone in the dark I cover the last kilometer to the first checkpoint which is at 20 kilometers on the course. When I enter the first checkpoint it is 1:51, a pretty decent time for the first 20 km of this night. In the check point I meet up with Mark and Dennis again and am welcomed by the wonderful volunteers of this event. After a quick refill of my softflask and a few pieces of cake at check point 1 (thank you Legendary Cooking team!) I head out the door and am just in time to join Mark and Dennis again for the second part on our way to the second check point. I am feeling strong and notice that I don’t have any trouble keeping up with these experienced long distance runners. Weirdly enough I am actually enjoying myself while running through the night and my mind starts thinking about a finish before daylight again. But there is one big truth within ultrarunning: “If you are feeling good during an ultra, don’t worry it will pass”. And so I would experience that later on. But for now I was feeling strong and the kilometers just pass by easily. I take the other two energy gels I had with me just to keep a steady flow of calories coming in. The course is fully marked but I still have my GPS handheld in my hand continously to get confirmation of being on the right course. Mark apparently feels strong as he disapears into the distance. Dennis, one of the other runners that momentarily joined us and me continue to run together. My GPS prevents us from taking a wrong turn a few times. And then we suddenly hear Mark behind us. He took the wrong turn my GPS prevented us from and had to trackback to get back on the course again and rejoined us. As we continue towards check point 2 Dennis is starting to have stomach problems and unfortunately he is falling behind. 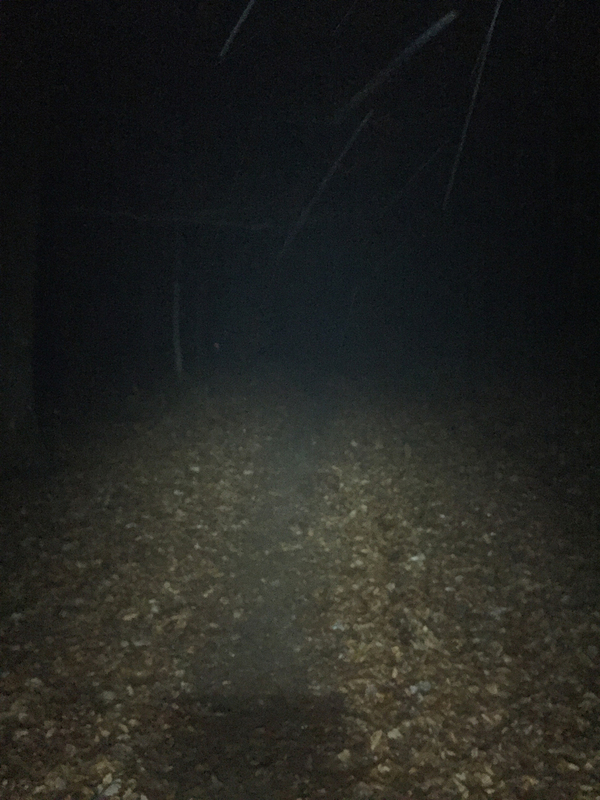 Unfortunately I did not really notice this until I stopped for a moment to eat something and notice that I do not get passed and also don’t see a headlamp approaching anymore. I catch up with Mark again and together we continue to check point 2. Check point 2 is rather close to check point 1, there is only 16 kilometers in between these check points and before we know it we cover them and as a volunteer points us to the entrance of the check point it is 3:35 as we arrive inside. Check point 2 is also the place where we have access to our drop bags. And as I walk through the halway of the building I look for my bag in the big line of drop bags. I recognize my bag, pick it up and walk inside. I post a picture on instagram just after I arrive at the check point, also to let Astrid know that I arrived at this point in the race. the picture does not really show that. While I refill my soft flask again I go through my checklist to make sure that my preparation of this dropbag was actually useful. Replace the battery of my headlamp. Change the batteries of the lamp around my waist. Check the battery of my GPS handheld, no need to change these. Eat, even though I don’t feel like eating I take a few crackers, a beef sausage and two chocolate dipped oreo’s from my drop bag. I remove the race bib from my bib-belt and put it on a fresh bib-belt that contains 6 energy gels and put it around my waist again. I check if I need any of the other steps on my checklist before I stuff everything in the bag again. As I look to my right I see that Mark is not feeling well and ask him if he needs help, he says to just let him be and so I continue getting myself ready to go out again. After visiting the toilet I am ready to go out again and in the mean time Mark has also prepped himself to go out and so we leave the check point again. It is just before 4 AM as we head into the night again, on our way to the third and final check point. The distance from check point 2 to check point 3 is almost 25 kilometers, the longest stretch in the course. It is also the part of the course that was the most annoying to run. Long straight roads of cobblestones varied with tractor tracks through open fields and trails of slippery clay. Oh and even though Stef and Tim keep insisting that the course is flat… it’s not. Especially this section contained quite some long roads with a slight incline. But it could also that it had something to do with being on the way for already over 4 hours. As we continue to run through the night I start to get trouble eating. For me this is the first time that this happens during a race, normally I can eat just about everything during a race and have no trouble getting calories in. Maybe it’s because I am not used to eating at 5 AM but I start to get nauseous already when I think of the food in my race vest. We approach the 50 kilometer mark, just over 10 more kilometer before we arrive at the last check point. I force myself to eat and take a small almond bar and a Just Nuts bar from my race vest. I manage to prevent myself from throwing them up again but with the nausea the pace is also more difficult to maintain. As I mentioned earlier: if you feel good during an ultra, don’t worry, it will pass. This was that moment for me. This part was more a mental struggle than a physical one. My body is in great shape and can still keep the same pace, but it does not want to due to the nausea and then the thoughts start circling in my head, “why am I doing this”, “why do I continue if I feel like this”. I have to stop a few times because my stomach is playing ping-pong with what’s inside it and I slowly see Mark disapear into the distance. Fortunately by now I have covered almost 57 kilometers and there are only 4 kilometers left until the third check point. As I am running along in the dark completely by myself I look around into the darkness and start to realize how special this is and I remember why I do this. This is adventure, this is why I get up for at 5 AM each day to train. This is what I love. Suddenly my phone rings. A though crosses my mind “who would call me at 6 AM on a Sunday morning?”. I stop and take my phone out of my race vest. I was too late to answer the call, but from the phone number I recognize that it is the organization of the race. I quickly call them back to see what is going on. And I hang up the phone, tuck it away in my race vest and with a smile on my face I continue towards check point 3. I arrive at the third check point at 61 kilometers at 6:35 just 5 minutes after Mark and 2 hours and 40 minutes after we had left the second check point. The distance ended up being 25,3 kilometers. Despite the problems with my stomach and the phonecall that’s still a pretty decent time I think. Inside I see Mark again and he reaches out to shake my hand as I appologize for falling back. Me, just after entering the third checkpoint at 61 km. At the check point I ask for a cup of thee and this warm drink seems to calm my stomach a bit and I immediately start to feel better. When I refill my soft flask it apparently has developed a leak as a small stream of water exits the flask at the bottom. Ok this is not usable anymore. And so I refill the reservoir of my race vest. This gives me 1,5 liters of water for the last 20 kilometers, which should be enough. As I sip my tea I take two painkillers to take the sharp edges of the pain in my feet. The most of the course is on a hard surface and my feet are starting to feel a bit sore after 61 kilometers of this. In the mean time as we are getting ready to go out again I see that Mark is trying to get his headlamp on. His main light has run out of battery and he has a small backup Petzl light that does not want to switch on. 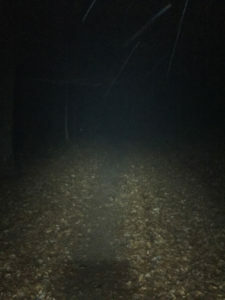 Luckily his main light is a Petzl Nao, the same as my headlamp and I still have a fully charged spare battery with me. So I give him my battery and we are ready to go out again at 6:50 AM. Before we go I text Astrid that I love her and that I am going to finish this thing!! And off we go 20.7 kilometers remaining until we reach the finish line!! As we leave the check point there is a clear mutual feeling of determination among the two of us. We both are done with this and want to get it over with. We start picking up the pace as we quietly run alongside eachother. As my Garmin Fenix beeps and shows the 64 kilometer split on my display I say to Mark “Hey this is already my longest distance ever run!”. He just acknowledges and keeps on pushing ahead. With about 15 kilometers remaining Mark’s stomach starts to have a life of it’s own and he stops for a moment. As he stands there bent over on the side of the trail he says “Just leave me and go on, you can still make it within 9 hours”. No way, I think, I am not going to leave this guy here after running 65 km together. And so I respond “No lets just walk a bit, I can use the break”. After a few minutes Mark starts feeling better and we switch to running pace again. By now we are closing in on kilometer 70 and are starting to complain about the course and the event in a joking matter. I guess that’s what we needed at that point to motivate ourselves. We complain about every little inch of positive elevation we encounter, every cobblestone, every piece of tarmac, etc, etc. As we just keep on pushing and pushing to get it over with. At this point we probably both had the unexpressed goal of finishing before 9 AM in our minds. As my watch beeps for the 75th kilometer I really notice the effect of all the training effort that I have put in over the past months because even though I have been running for 12 kilometers further than my longest run to date I still feel that I can continue this until the end. But I should not have let that thought enter my mind as I hit a small dip at 77 km. I slow down to a walking pace and say to Mark “If you can continue, go for it.” He replies “Oh no, you helped me through my dip, we are finishing this together.” This is such a boost for me that we continue running, there is just less than 5 kilometers to go at this point as the sun starts to rise and we are surrounded by daylight. In the last few kilometers through the forest on our way to the finish we increase the pace and as I glance on my watch I see it get below 5:00 / km as we make our way to the finish. We race down the parking lot, make a sharp right turn and as we approach the door of the big hall where the finish podium is Mark says to me: “You navigated, you go first”. The door to the hall swings open and everyone there starts to applaud. I increase the pace even further as I run to the stage. As I run up to Stef on the stage I stop my Garmin. 9:00:16 It is registered at 9:00 by the race organization. Stef congratulates me and hangs the medal around my neck. I thank Mark who is alongside me on the stage for this adventure. Astrid helps me with my running gear, gets me a cup of tea and as the congratulations come in I realize that it is over. Mission acomplished. I take a seat and sit there and gaze around, overjoyed and proud. What a way to finish the running year! I have prepared thoroughly for this race both in training and gear-wise, was my preparation overdone? Maybe it was and maybe I could have achieved the same result with less effort. But the preparation was part of the fun and a learning experience for future adventures. And besides that, I really really love training. 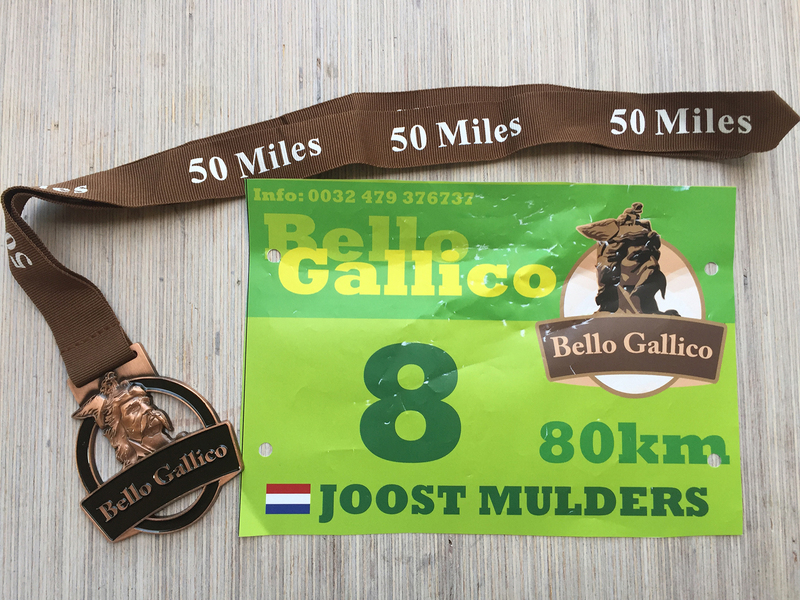 Just after the finish I was sitting at a table and someone who recognized me from my blogs approached me and expressed that he really would not want to get into training runs of 60 kilometers or more. For me these long training runs are an adventure that I enjoy as much as and sometimes even more than these races. 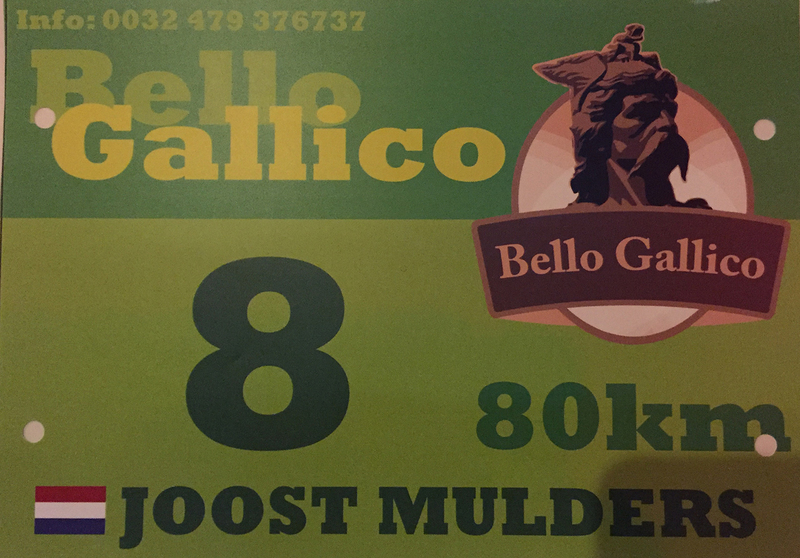 I have finished the Bello Gallico trail! It has been an incredible journey, not just the race itself but the entiry road towards it, from picking up running in spring 2014 to finishing this race with several milestones along the way, from my first 10 km race in Etten – Leur to the first marathon, the first ultra trail and even the DNF’s that are also part of this. Even though I crossed the finish line, it is also the start of more and bigger adventures. I don’t know what these adventures will be exactly, but I do know that I love this part of my life and enjoy it to the fullest. It is not really common to end a blog post with thanking people, but I will just ignore that and thank a few people that mattered in this journey. Thanks to my parents who show interest and have followed my preparations and followed me on the live tracking. Even though it is not an activity that they fully understand, they support me. Thanks to my friends in the trailrunning community. Tom for giving advise and support. Maarten, Marek and Dennis for being an inspiration, Mark for this unforgettable nightly adventure (I know that this sounds weird if you don’t know the context). And Stef and Tim for organizing these crazy things. And most of all thanks to Astrid, who supports me in so many ways in this lifestyle, is proud of me no matter what my results are and never complains if I am out for a full day or night of training and loves me for who I am with all my flaws that come with me. Tomorrow Astrid and I will go on a two week holiday to the Cape Verdian islands where we will enjoy the warm weather, the sun and life on the beach during which I will slowly start thinking about the challenges of 2017.